As I've explored on Who What Wear before, moving in with your S.O. can really change your whole closet organizing game. Suddenly, the amount of clothing, shoes, and other accessories in your house has doubled, and all the work you previously invested in keeping your stuff just so goes kaput. Well, I also recently had the joyous experience of teaming up with the S.O. in question to organize our overflowing closet, and I discovered that the project actually isn't as overwhelming as it can seem—and the results are beyond rewarding. (It just feels so good to look at the former mess you've turned into a neat pile, doesn't it?) We spent a relatively modest amount of money, investing in just a few key pieces that have upgraded the setup of both our wardrobes. Keep scrolling to see the pieces we picked and why! As a woman with a lot of jewelry, I don't find anything as infuriating as a chaotic mess of tangled necklaces and bracelets. 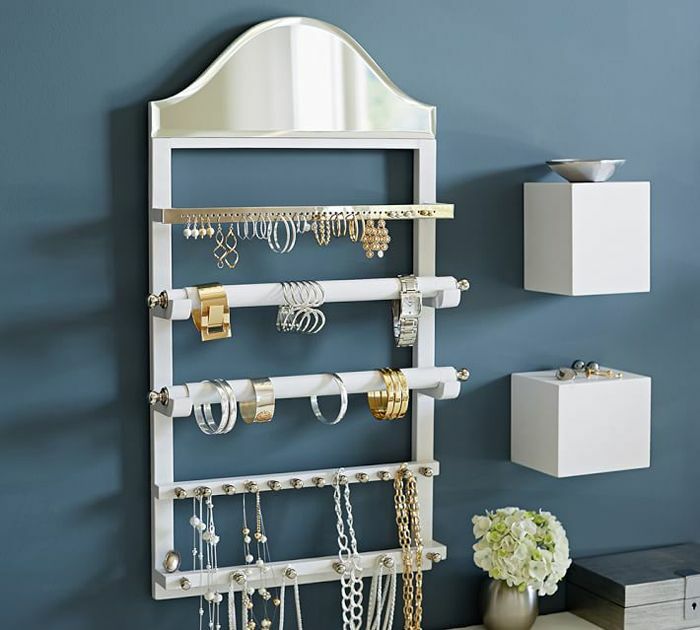 Every woman needs a way to organize her jewelry, and this Pottery Barn pick is just as lovely as it is useful. A shoe rack is a must when you're dating a self-proclaimed sneaker-head, and I love how sleek and simple this one is. This tool is great because it's so open-ended. It's just some additional shelving you can hang in your closet—what you use it for is totally up to you! From scarves to ties to belts, this Ikea piece will help to declutter some of the smaller pieces of fabric that so quickly overtake your closet. About halfway through our organization project, we both admitted defeat: We simply didn't have enough room for all our stuff in one closet, and we needed an additional way to hang things. I love this garment rack because it has a top shelf (for my dude's hats) and a shoe rack at the bottom, and it's extendable up to 71 inches! If you made a list of the ugliest household items around, we bet your hamper would be close to the top. Not so with this cute little guy! And it's nice that there are two drawers, for overspill or additional storage. I've spent most of my life just tossing my handbags up onto the top shelf of my closet and praying they don't fall back down on my head. No more! When all else fails, use this handy tool for shoes, bags, sweaters, and beyond! What is YOUR secret for a super-organized closet? Tell us in the comments below!